Today is United Nations World Water Day, when the organization and many others mark the urgent need for fresh water everywhere. In this country, the day arrives with a bit of irony: The National Oceanic and Atmospheric Administration said Thursday that almost two-thirds of the continental U.S. is threatened with major to moderate flooding this spring. Then there’s the rest of the world. According to the United Nations, 2.1 billion people do not have access to clean water in their homes, and four billion people -- that’s two-thirds of all of us on this planet -- experience severe water scarcity at least one month out of every year. In 2004 Procter & Gamble began working on the problem, eventually with 150 partners, and started the Children’ Safe Drinking Water program. Earlier this week it announced it had reached its 2020 goal of providing 15 billion liters of clean, safe drinking water a year early and set a new goal of delivering 25 billion liters by 2025. P&G says that adds up to 100 billion new glasses of water. It may seem ironic -- or just logical -- that the packaging giant is achieving its results because of a simple purification process invented by a P&G laundry scientist. Of course, it comes in a packet. Users in 90 countries take the dirty water they have, add in the powder and in a half hour potentially deadly water is drinkable. Among the partners P&G has teamed with on the program are the National Geographic, Walmart International, Save the Children, CARE and World Vision. 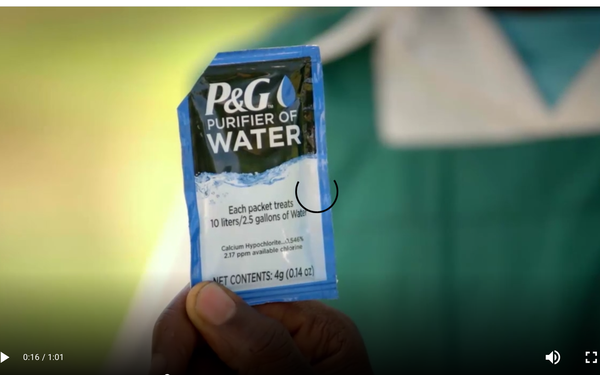 P&G and Walmart collaborated so every P&G product purchased in various countries where Walmart has a presence will trigger a contribution to the “1 purchase=1 liter” promotion. Probably the most recognizable face in the Children’s Safe Drinking Water effort is actress Patricia Heaton, a World Vision ambassador. The aid organizations Save the Children and CARE will concentrate their efforts on an emergency response to the Ethiopian crisis. World Vision will try to deal with water emergencies facing more than a million people in 15 African, Asian and Middle Eastern countries. The water problem has gotten some other major-league attention lately. Stella Artois, the Anheuser-Busch InBev brand, ran a popular ad during the Super Bowl, showing both Cosmo-tippler Carrie Bradshaw (Sarah Jessica Parker) and White Russian swiller The Dude (Jeff Bridges) ordering a Stella instead. It was a roundabout way to help the brand “Pour It Forward” with the charity it favors, Water.org.